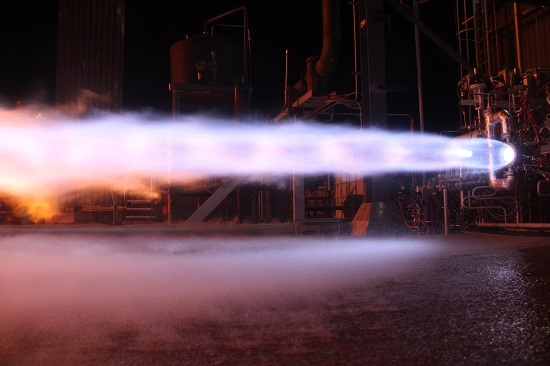 KENT, Wa., September 30, 2015 (Blue Origin) – Blue Origin announced today the completion of more than 100 staged-combustion tests in development of the American-made BE-4 engine. The test series achieves a key milestone in engine development, providing measurable performance data in advance of the upcoming Critical Design Review. The staged-combustion testing configuration included a representative BE-4 preburner and regeneratively cooled thrust chamber using multiple full-scale injector elements. The test series confirmed pre-test predictions of injector performance, heat transfer, and combustion stability. Data gathered during testing was used to refine the design of the preburner and main combustion chamber injector elements, preburner and main combustion chamber sizing, and the regenerative cooling configuration. Testing also demonstrated the critical manufacturing processes for the thrust chamber and nozzle, including the use of additive manufacturing. The BE-4 is a liquid oxygen, liquefied natural gas (LNG) rocket engine that delivers 550,000-lbf of thrust at sea level. In addition to its use on Blue Origin’s orbital launch vehicle, the BE-4 will be used on United Launch Alliance’s next generation Vulcan launch system for national security, civil, human and commercial missions. Development of the BE-4 has been underway since 2011 and hot-fire testing of engine hardware is ongoing at Blue Origin’s facilities in West Texas. Awesome! Good for their team! Looks like Blue Origin is going to be a real player. wonder how far away they are (time-wise) from finishing development of the engine. Will Blue Origin’s own rocket compete in any way with ULA’s Vulcan? This is the real question regarding BE-4. Also, whilst using the same main engine, BO have said/implied that they are aiming for a vertical landing of the intact booster. Whereas, with Vulcan “reusability”, ULA are going….weird!. It might make sense for Blue Origin to build their rocket in a different payload class to Vulcan. If Vulcan wins business, then BO get paid for the engine, if it’s not been reused. If Blue Origin win the business, then they lose the engine fee from ULA, because ULA aren’t doing the job. Might be an idea to build their rocket with a payload of 30-35tonnes to LEO, whilst recovering the first stage. They can attack Falcon 9 with this rocket by offering better economies of scale, because it’s a bigger rocket, and attack FH by being cheaper. Anyone that can conveniently rideshare on this rocket will be tempted to go Blue Origin together with anyone who doesn’t need the full 53tonnes of Falcon Heavy. My hypothetical BO rocket would appear to carry about twice the payload of an Atlas 5 531 to LEO. The Atlas 5 531 carries up to 7,475 kg to GTO, so I would expect this hypothetical BO rocket to carry about twice that to GTO which is 15tonnes. It sounds quite good, this future competition between SpaceX and BO. However, will be the market elastic and large enough? Depends on launch prices, and the order that things happen. If BO builds it’s big rocket and flies it initially in an expendable mode (which is what I expect that they will do), then they will have a price typically somewhere in the region of today’s F9 price. So if their rocket is the same payload as F9, then maybe they’ll be a bit more or a bit less than $60m per launch. If they are twice the payload of F9 as I suggested above, then maybe they’ll be somewhere in the $80m – $110m per launch range. If by the time BO launch their rocket, Space still haven’t got their first stage rapid reusability worked out (not just the landing), then F9 will still be priced similar to today. In this scenario we would expect that the flights that constitute Spacex manifest today would be split between BO and Spacex. Spacex would still have the ISS crew and cargo flights and Vulcan would likely have a chunk of NRO / USAF flights plus perhaps a few commercial ones. So, in summary, there’s no significant increase in market size. Alternatively, if Spacex have got rapid reusability working, (lets assume that they are reusing the first stage three times at this point) before BO do their first orbital launch, then Spacex’ prices may have fallen by 50%. So they would then be charging around $30m per launch for a F9 launch on a profile that allows first stage recovery. This fall in launch prices, would stimulate demand for launch, in particular, cheapening activity on a commercial space station (if Bigelow have launched by then) and an increasing level of interest in the moon, resulting in a launch market that is bigger than today. BO would enter into this market, I would suspect initially flying their rocket in an expendable mode, and pricing each flight at a loss, in order to win some business from Spacex, and would then work on perfecting reusability. Once reusability is working, then their rockets will be flying at a profit and they can attempt to win a bigger chunk of the market. So at that point, we would expect that the market, in simple terms, splits mainly between Vulcan, some Proton derivative, F9 and the new BO rocket. It is likely that F9 and the BO rocket would be cheapest and so have the larger market shares. Out of curiosity, why is that pulsed?